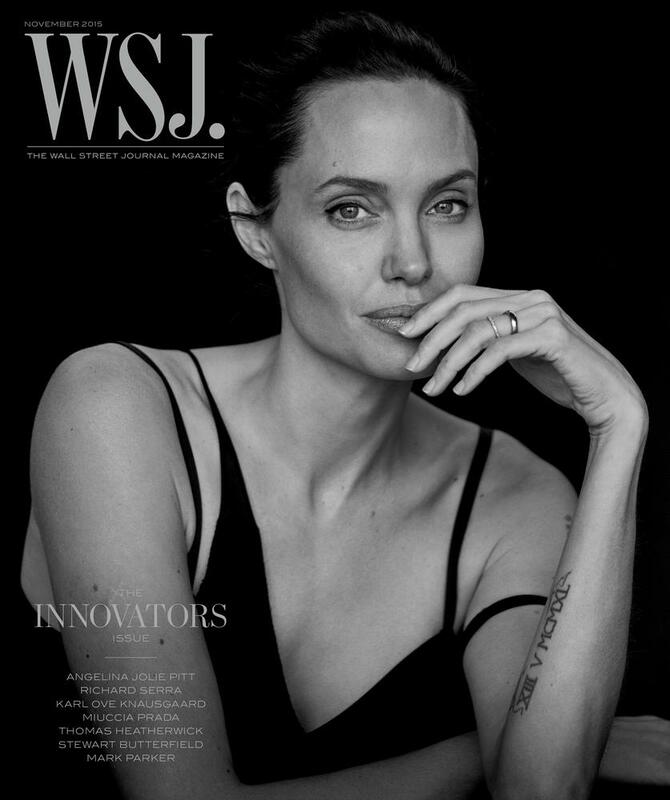 Angelina Jolie covers the November issue of WSJ Magazine one day after being honoured by the organization at it’s fifth annual Innovator Awards at the Museum of Modern Art in New York City. Jolie who was awarded Entertainment/Film Innovator of the Year, opens up about suffering from depression as a teen, her career and family life with husband Brad Pitt and their six children – Maddox, Shiloh, Zahara, Pax, Vivienne and Knox. As a mother, Jolie says she tries to ensure her children never have to worry about her. “I want to make sure my kids are never worried about me. Even if I’m going through something, I make sure they are very aware that I’m totally fine. I’ll stop and make a joke, I talk to them. I never, ever want them to have that secret worry and feel that they have to take care of me,” she tells. Jolie describes herself and Pitt as normal parents. “We wake up, we make breakfast. In our domestic life, we’re Mom and Dad. And often we’re dorky Mom and Dad, which the kids find ridiculous,” she explains. The daughter of famed actor Jon Voight also explains why she suffered from ongoing depression in her teens. “I grew up in L.A., where focus is very inward. I didn’t know why I was so destructive and miserable. I didn’t appreciate or understand my life…I was raised in a place where if you have fame and money and you’re decent-looking and have the ability to work in this industry, you have everything in the world. Then you attain those things and realize you still couldn’t be more empty. I didn’t know where to put myself,” she told. Pitt who is also interviewed by the magazine gushes about Jolie and her dedication to their children. “When Angie has a day off, the first thing she does is get up and take the kids out. This is the most important ‘to do’ of the day. No matter how tired she might be, she plans outings for each and all. She has an incredible knack for inventing crazy experiences for them, something new, something fresh. I may be the bigger goof of the pair, but she invents the stage,” he tells. The actor reflects upon Jolie’s decision to tell the public about her mastectomy and ovary removal. To read the full interview visit WSJ online. The November issue WSJ Magazine hits newsstands this Saturday, November 7.